Is Astrology a “Real” Science? “What’s your sign?” Based on where your birthday falls in the calendar year, you are considered one of the following twelve signs: Virgo, Libra, Scorpio, Sagittarius, Capricorn, Aquarius, Pisces, Aries, Taurus, Gemini, Cancer, or Leo. Within each sign, there are certain characteristics that each one apparently possesses. It seems that the following of horoscopes is becoming more and more popular. Books have and are still being written about this subject, breaking down each sign’s history, love matches, faults, future occupations…the list goes on. Popular newspapers, such as The New York Times, dedicate a small section to monthly horoscopes. Entertainment magazines and clothing stores take social trends and turn them into something (material or otherwise) that they can profit from. That being said, magazines like Cosmopolitan and clothing stores like Urban Outfitters have profited by their zodiac columns and apparel. If there wasn’t a phenomenon surrounding the (maybe) science of astrology, then why are these companies spending money on producing such content/products? What makes this notion so attractive (and believable) to a society? The foundation of the zodiac is based on astrology: the belief that celestial positioning affects human tendencies and natural occurrences. This abstract concept does include scientific elements, such as studying the orbits of planets, stars, the sun, and the moon. But is there any credible backing that solidifies astrology a spot amongst other “actual” sciences like chemistry, biology, and physics? According to the Merriam-Webster dictionary the definition of science is basically acquiring knowledge of the various aspects of the world through conducting experiments. Taking this definition and applying it to astrology diminishes its credibility. Yes, astrology aims to explain affairs that occur in the world, but the explanations are usually broad and so could mean that the results of the experiments can be manipulated to prove that is fit the hypothesis or expectation, (Understanding Science). Providing inclusive generalizations as to why people behave in such-and-such a way is hardly reliable. In fact, it comes off more like guess work. From Tuesday’s (August 30th’s) lecture, Andrew talked about what science is. He said that science, broadly, is: a systematic collection of data through observation and experiments, the development of theories to organize and explain all of this, and the use of professional institutions and norms such as peer review to subject claims to scrutiny and thus develop reliable knowledge. Although some astrologists use star charts to validate their advice or readings, there can be no conclusive relationship as to why a positioning of a star or a planet being in retrograde means that a particular zodiac sign will be temperamental, or passive, or intellectual. As far as I’ve researched, there is no university that offers a course studying astrology. It may be incorporated within a myth and mythologies course, but that doesn’t validate astrology as a science. It actually weakens the argument because we know that folktales are not real. There is no hard evidence that myths or astrology is reliable in the information it presents. But living in a world that has long since evolved from believing in myths like those in Homer’s Odyssey, it’s incredible that yet there is still a following for this theoretical concept. It is universally known that nature (one’s surroundings) and nurture (how one was raised) are the underlying influences of the “why’s” and the “what’s” of one’s life. For example, my sign is a Scorpio, which means, amongst other things, that I’m “obsessive.” Admittedly, I can be obsessive, especially when it comes to my work for my classes. But my two best friends are a Capricorn and Leo and I’ve seen them obsess over their work as well. Anyone can be obsessive over something that they’re passionate about, so to use such words to classify someone seems impractical and not scientific, especially because emotions and moods are relative and based on context. I think what it comes down to is that astrology, for the masses, is a form of entertainment. It’s alluring, not for its scientific backing, but because it’s another way to unofficially classify people; to feel like one is part of a greater group. The columns are entertaining to read, because if by chance the advice or summary is relatable to your life, it’s creepily exciting. This entry was posted in Uncategorized on September 1, 2016 by Valerie Lauren Murphy. My mom has always obsessed with zodiac signs, and she definitely passed that obsession down to me. I read my horoscope religiously. Sometimes, though it may be just by chance, it seems to be freakily real. This article was very interesting to read, as I have always wondered the legitimacy behind the few sentence I would read in the morning and base my entire day off of. Although it does not seem like there is any scientific information to backup my daily horoscope, I will still continue to check it everyday. And as a GOT fan, I appreciate the quiz letting me know that because I am a Libra I am the same as Robb Stark. 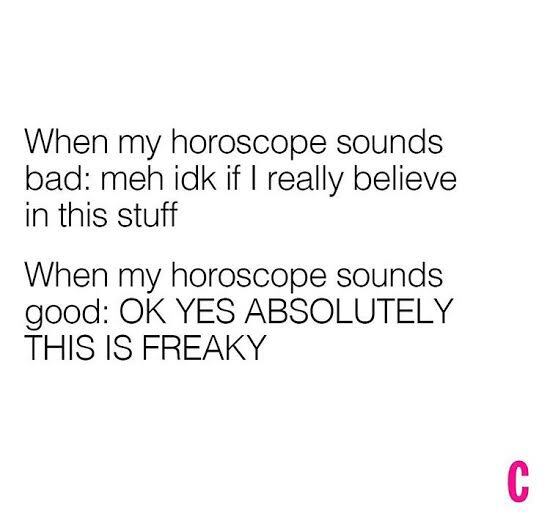 I love astrology but I definitely have a problem taking it seriously too. What you said about no colleges offering courses on astrology solidified it for me, astrology is not a legitimate science. 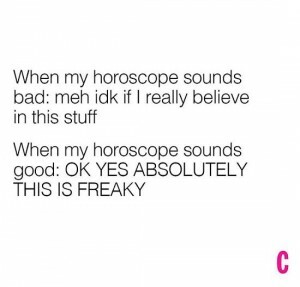 Also, what makes it extremely incredible is that people tend to agree with their horoscope if they like it and tend to ignore it if they don’t like it. I loved reading this and I’ll still read my weekly horoscope, but I agree it is just for fun! I’m an Aries too! But the thing is, none of my characteristic fits into the “Aries personality category”, so that’s why I don’t believe in horoscope. I knew there is a concept in the Psychology area which is called Priming, exposure to one stimulus influences the response to another stimulus. This basically means some information inserted towards your brain unconsciously, which influenced your mental processes. So sometimes I felt like when you read something like a book about Zodiac or horoscope, you related the content towards yourself or surroundings unconsciously, no matter if it’s really telling the truth or not. So for reducing the amount of stereotype or bias. I normally just ignore those informations. Also, I don’t think it’s wrong for people to believe in horoscope, just don’t take it too serious. Being an Aries myself, I never really cared for astrology. My ex-girlfriend always told me that our signs always described us, but I never really understood it. It’s interesting how so many people put a lot of faith and actually rely on a lot of important decisions on this “science”. I personally believe the reason major stores sell things related to astrology is because they see how much people, usually young women, go for it. That’s the art of supply and demand. Likewise, I think the reason people buy into astrology is because they want some form of explanation for their lives. Hopefully, they can realize that they are in charge of their own future, not just the “signs”. Good article, but maybe add more links or photos throughout to keep the reader’s interest.